Belsham’s debut starts off at a cracking pace from page one as she begins her tale from the killer’s perspective as a victim is precisely flayed. From there, the investigation gathers rapid momentum with clues and red herrings littering this gripping story. What really makes this story is the characterisation of the main protagonists. We have Marni who is a tattooist and discovers one of the victims, making her part of the investigation. Then we have DI Francis Sullivan who goes to church and can’t think of anything worse than inking his skin! Add to the mix Marni’s ex-husband, Thierry and Sullivan’s no.2, Rory Mackay who is displeased with Sullivan’s promotion over him and is quite content to serve up Sullivan for his own ends. These complicated relationships spices up Belsham’s story even more as the cadavers pile up in Brighton. There is not much more I can say without giving away something, so I will simply advise you to devour this debut as I am sure there will be more revelations about Marni and Sullivan to follow. A cracking start to a highly original series. 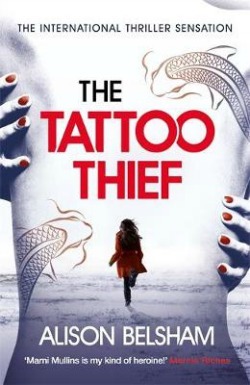 1) ‘The Tattoo Thief’ deals with the world of tattoo artistry. 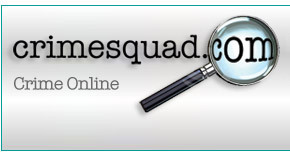 Why did you place your crime novel in this lucrative industry? Have you any links with tattoos? I’ve been fascinated by tattoos for years, but it wasn’t until I got my own tattoo in 2015/16 that I actually thought about using the world of tattooing as a setting for a novel. My interest dates back to childhood. My grandfather was a submariner and, when posted out in China in the 1930s, he got stunning dragons tattooed on each arm. As a child, I always wanted to see them – it was at a time when hardly anyone had tattoos and I was fascinated by the colours and the artistry. However, despite my interest, it wasn’t until relatively recently that I finally got the nerve to have my own tattoo. In 2015, I decided to get an octopus tattooed on my arm. I found a tattoo artist, who happened to be based in Berlin, and travelled there for my first session. That night, as lay in the hotel bedroom, too excited to sleep, I thought to myself, ‘At last, I’ve got my tattoo. No-one can take it away from me.’ A minute later, my writer’s brain replied, ‘But what if somebody did?’ In that moment, I realised I had the premise for a crime novel – the theft of the one thing you don’t believe could be stolen. It was an idea that immediately took root, and the result was ‘The Tattoo Thief’, the first of a trilogy of murder mysteries set in the world of tattoos. 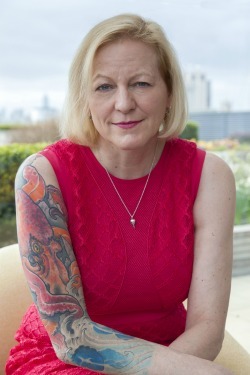 2) Marni Mullins is a tattoo artist who gets caught up in the murders. Why did you make Marni your main focus in ‘The Tattoo Thief’? Marni Mullins is a wonderful character to write. She’s a tattoo artist with a big heart and a dark past – and as a single mother working in a male-dominated world, she has to prove herself time and time again. It’s made her tough, but there’s a streak of vulnerability as well that makes her a compelling force through all three books in the trilogy. She also makes a great foil for my DI, Francis Sullivan, who’s young for his rank and a little wet behind the ears. He’s straight-laced, religious and hugely ambitious, but when he gets thrown into the world of tattoos, he’s completely out of his depth. Marni Mullins takes him under her wing, despite her well-grounded mistrust of the police – and the sparks fly! 3) I like the chemistry between DI Francis Sullivan and Marni, but DS Rory Mackay also comes in to his own. Will we be seeing the three of them in the next novels? Rory Mackay is an old school detective who’s been passed over. At the start of 'The Tattoo Thief', Rory’s furious that Francis Sullivan has been given the job that he was eyeing up for himself. Rory wants nothing more than to see the new DI fail and isn’t beyond giving him a push… There’s a great dynamic between these three characters. Even though they’re on the same team, they spend as much time fighting each other as they spend trying to track down the killer. It makes for some explosive confrontations and there’s plenty more to come in books two and three of the trilogy. 4) You sprinkle a few morsels about Marni’s past within the book. Are we going to find out more about her time in France? Marni’s dark past is hinted at in ‘The Tattoo Thief’ – she has reasons to distrust the police and things that happened years ago seem to be coming back to haunt her. Without wanting to give anything away, Marni’s personal story will move to centre stage and eventually the readers will learn exactly what happened to her twenty years ago that has shaped the woman she is today – and how that past is going to come back to haunt here. 5) The book is based in Brighton, which I felt came alive in your novel. Do you have a link to Brighton? If not, why did you base it here? I’ve never lived in Brighton, but it’s a place I’ve visited often since childhood – and even more now, since my books are set there. Brighton made perfect sense to me when I was choosing the location for ‘The Tattoo Thief’. Not only does it have a cool alternative vibe about it and plenty of extraordinary and intriguing locations, it also plays host to one the country’s best tattoo conventions every year, which made a perfect kicking off point for the action. Rebecca - Daphne du Maurier – this has to be one of the first and certainly the best psychological thriller ever written. The characterisation is outstanding and the plot has a great twist at the end. It’s a book that literally haunts the reader long after they’ve finished reading. Miss Smilla’s Feeling for Snow - Peter Hoeg – long before the current Scandi crime wave, this beautifully written and intelligent book captured my imagination and opened my eyes to how literary and intelligent crime writing can be in the right hands. Presumed Innocent - Scott Turow – this has all the classic ingredients I love: a taut courtroom drama, and a man accused of a crime he didn’t commit who then has to solve the murder to prove his innocence. It’s a compelling read that’s hard to put down.